The Regenda Group have implemented VerseOne’s innovative Vocoll Live Support solution across their web estate, so that they can deliver improved customer service more efficiently. Like all Housing Associations, Regenda’s Customer Services Department is faced with increasingly tech-savvy customers who demand a higher standard of service whilst, at the same time, having to do more with the same, or fewer, resources. Vocoll Live Support was exactly what Regenda’s Customer Services Manager, Chris Long, had been looking for, in order to address these issues. "We needed to increase the volume that our customer service team could handle without increasing costs, and in an ideal world even saving us money. The implementation of VerseOne’s Live Support platform has meant just that." 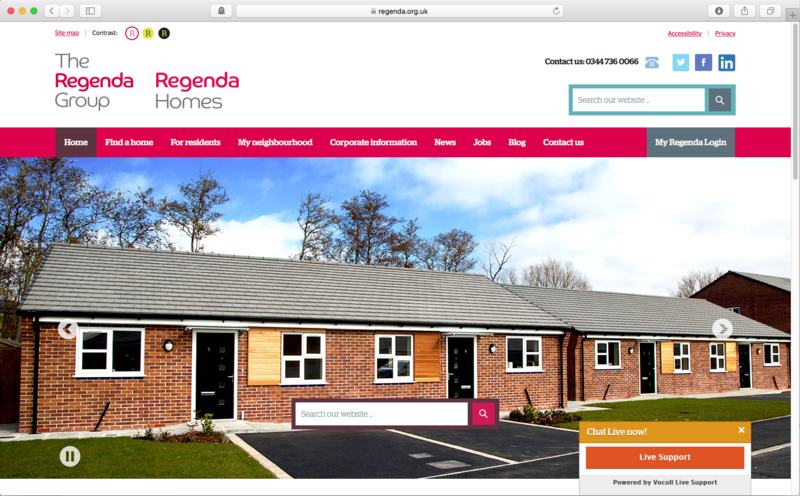 Regenda started with a trial version of Live Support, and almost immediately found it to be incredibly popular amongst their tenants: for the first few months, they did not even advertise the service but, with it front-and-centre on their website, they found that customers flocked to use the service. Live Support has also proved effective within Regenda’s Customer Service Team. The ability for customers to choose Topics means that Regenda can ensure that “chats” are picked up by the right person, and the ability to easily handle multiple simultaneous enquiries has meant faster response times for customers. In the last 18 months, Regenda’s Customer Service Team has successfully closed 3,000 enquiries; there have been further benefits, as described by Chris Long. "We are in a better position for the future—we will be able to handle the predicted volume increase our customer service team will face, with changes such as Universal Credit, more easily. Alan Neilson, Founder and Executive Chairman at VerseOne, outlined why the award-winning company developed Live Support. "Vocoll Live Support is part of our full-stack communications and integration platform, through which we empower our customers to successfully undertake full digital transformation. "We are delighted to work with Regenda. Not only is it fantastic to be able to meet our customers needs, but their feedback has proved invaluable in ensuring that the further development of the Vocoll Live Support provides the greatest value for RSLs." As with all of its products, VerseOne continues actively to develop the Vocoll platform and, with over 15 organisations now using the product, it is going from strength to strength. In 21st-century Britain, chronic conditions are becoming more common due to lifestyle changes and an ageing population. Accordingly, the NHS is feeling the pressure, as are patients, who want convenient and cost-effective ways to help them self-manage their care. For busy or home-bound patients, coming in for an appointment isn’t always easy or straightforward—and face-to-face appointments take up time and resource that isn’t always necessary if the focus of the visit is on information prescription and advice. And for patients with mental health issues, online therapy can help with daily maintenance. Healthcare providers are exploring new ways to provide treatment outside of the traditional appointment, and online live support is a channel which brings benefits to both the patient and to the healthcare professional giving them help. Last week, the BBC interviewed Nick Martin, a mental health patient who shares his story of online live support as part of treatment for depression, and how using this online channel to speak to someone and get advice has improved his care and ability to cope with his illness. Listen to the interview with Nick Martin here. If you think online live support could help benefit care in your organisation, try a free trial of Vocoll Live Support, a secure, access-anywhere channel for live help and advice. So, you know the story, because I'm sure that you have some of the same issues: at VerseOne, we realised that we were sending large amounts of bulky and, sometimes, unnecessary internal emails. The sheer volume of emails not only meant that our people were spending too much time sorting through them, but also that important communications were sometimes missed. So, we decided to change this by writing our own instant chat application, using the very latest technologies. Over the last year, Vocoll Team Fusion has changed the way that we communicate—for the better. The headline stats don't lie: in just ten weeks, around 30 VerseOne employees sent over 32,000 messages. This has steadily ramped up as people have got more comfortable with the application, so that our current average is over 4,000 messages a week. In the 18 months or so, our staff have sent nearly 200,000 Team Fusion messages—and most have now switched away from email as their default internal comms tool. And me? Well, personally, the number of emails that I receive every day dropped from over 150 to less than ten (your mileage may vary). The vast majority of those 200,000+ messages would previously have been sent by email—and many of those would have been directed at people who didn't need to be copied into the conversation. This targeted approach, combined with the quicker response times that Chat tends to encourage, we meant that communication within VerseOne has become more effective. Fewer people miss important messages—and there's a good deal less shouting across the office! Of course, there have been a few challenges. The first is quite simple—that people expect instant chat to get an instant response. As such, we have set expectations internally that a response may not be forthcoming for an hour or so. After that time, the app will send an email (I know, I know, but old habits die-hard) just in case they haven't switched on the desktop notifications. The second has been that people are used to searching their emails for particular content. However, we have provided a Universal Search within the application which has given people confidence that they can find the information that they require within conversations. The final issue, prosaically, is that people are still wedded to email—it's a 25-year-old technology, and people are used to it. However, VerseOners, and even some of our customers, are embracing Team Fusion and I, for one, cannot wait until we switch off internal email. We have been pursuing an aggressive weekly release cycle, so that we can incorporate our staff's feedback into the product. We are now sitting back and contemplating some bigger ideas—including how we can eliminate external email for good. VerseOne was founded specifically to make a difference in the enterprise content management arena. Our open standards VerseOne CMS provides the core publishing platform for over 200 websites, intranets and secure portals—providing our customers with a secure, flexible and robust way of delivering their content to their stakeholders. 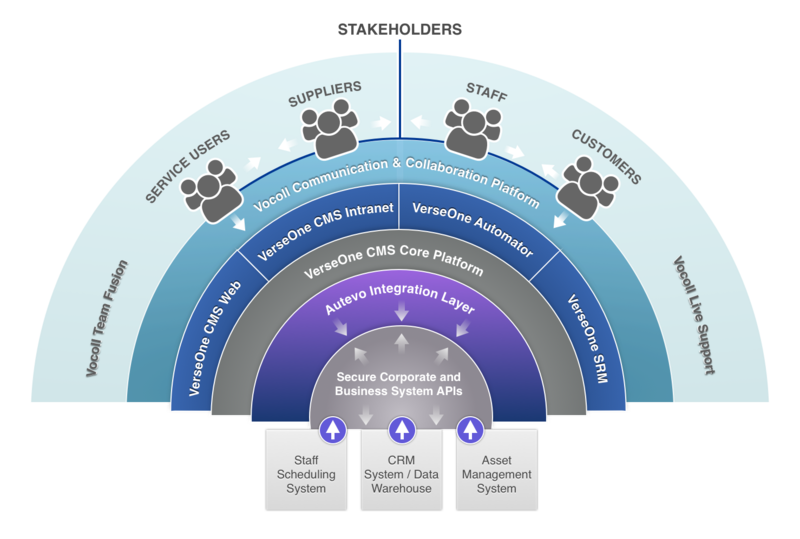 Our integrated but modular full-stack solution, combined with our creative and digital services, ensures that VerseOne is able to provide end-to-end solutions that provide real digital maturity. reassures users that their personal data is secure. capable of communicating your brand values as part of your digital fingerprint. Our in-depth knowledge of the enterprise sector, our understanding of wider user experience (UX), and our dedication to investment in our product, has allowed VerseOne to create an integrated but modular full-stack software solution that is specifically designed to achieve both channel shift and digital transformation. 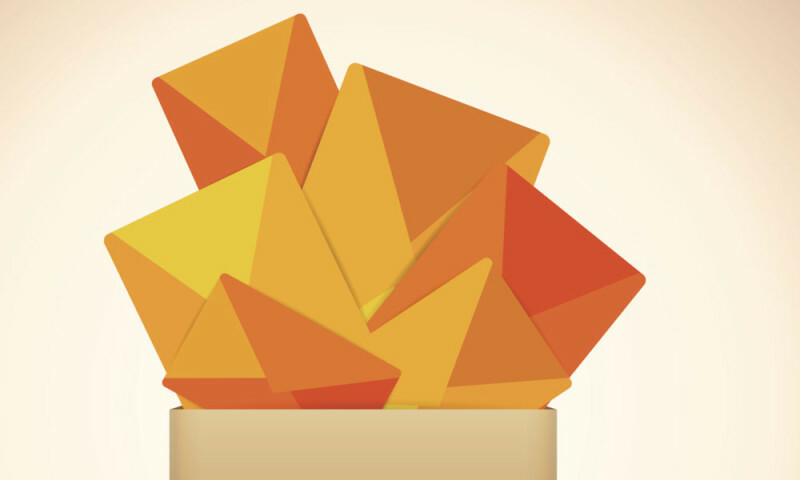 Our guiding principle has been that, in order to realise the true value in your content, you need to be able to gather, normalise, personalise, and share it. Vocoll—our integrated collaboration platform is optimised for direct, real-time sharing of content and communications with stakeholders. Vocoll has been specifically designed to be easy to set up—all you need is your work email address, and we'll do the rest. Give it a try, and improve your daily communications with your colleagues, your suppliers and your customers. Vocoll has been crafted by VerseOne Group—a multiple award-winning, market-leading online business solutions provider. VerseOne creates enterprise-level, content and customer management platforms, supported by a comprehensive suite of digital and creative services to allow organisations to gather, normalise, personalise and share their content—unlocking the value in their intellectual property. Sorry there is currently nobody available on shift, please check back later.